Luisa Heckenkamp is a Suzuki piano teacher, and has been teaching the Suzuki Method for 2 yrs. She was born in Manizales Colombia (South America), but then was adopted at 3 into a large family of currently 10 members and has been living in the U.S for almost 18 yrs. She is fluent in both Spanish & English and speaks some Italian and French. She was raised in a Suzuki based environment—listening to her older siblings playing the violin, piano, marimba and percussion. This atmosphere helped foster her love for music. Insisting that she, too, learn the piano, Luisa began her studies beside her mother who had been a “Suzuki Mom” for 30 yrs. at the time. She has been seriously studying and playing the piano for over 5 yrs. Luisa has a deep love for music, especially classical, and enjoys teaching & helping kids to learn. 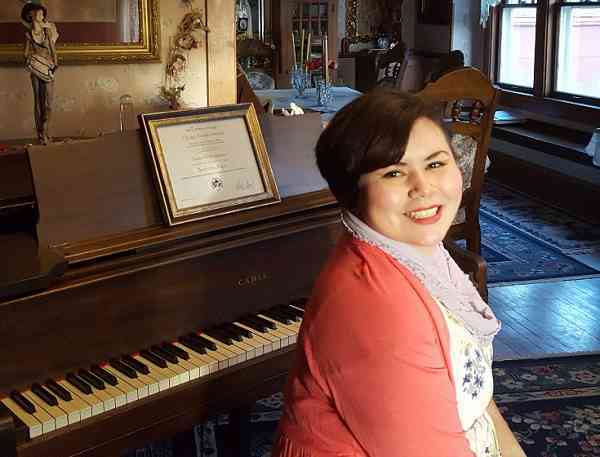 Her main goal is to instill a love for music in all her students, as well as their parents, and to bring out the musicality in all of them as well. She believes that all children can benefit from learning and appreciating music and this education will additionally aid the student in his/her other studies by teaching them patience, fortitude, discipline and memorization in a very enjoyable and exciting way—thereby, creating a positive and optimistic atmosphere for her students to celebrate their musical talents and accomplishments through a confident and trusting teacher-student relationship. Currently, she is continuing her teaching education in the field of the Suzuki Method, and pursuing her career in Music, as a teacher and performer. She enjoys playing for weddings, and other gatherings. If you would like to get more acquainted with the Suzuki Method, Luisa also recommends a book for the parents to read, entitled: “Nurtured by Love,” by Dr. Shinichi Suzuki.